In V6.2, the Case Manager portal is the default portal for applications created with the Application Accelerator, and is recommended for new applications. This article describes the portal's facilities and features. The My Cases tab contains information about work items (cases) associated with case types defined in the Case Designer gadget on the Case Management landing page. The My Events tab lets users monitor business events, and view upcoming goals and deadlines. The My Reports tab provides the Report Browser, which displays reports available to the user based on report definition rules, and may also display List View and Summary View reports. Here is an example of the portal in the work group view. A navigation tree in the left panel enables users to select and open each view. The tree can also be used to transfer work among operators and workbaskets. The tree has two top nodes: Work Group and Workbaskets. Selecting a time interval — Using links at the top-right corner of the center work area, the user can filter work statistics for the following time periods: today, this week, this month, this quarter, last 7 days, last 30 days, or last 90 days. Work Group — The name of the work group appears next to the icon. The user clicks the icon to display a list of work group operator names below the top node. The number next to each name indicates the operator's total number of assignments. A name in bold text indicates that the user is the Manager (Sandra Glover in the above example) defined in the Work Group rule form. 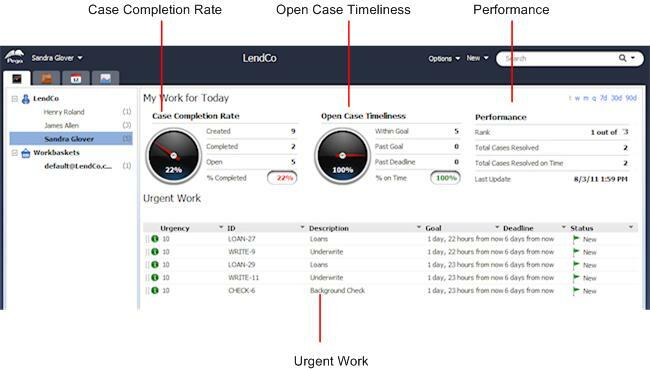 Case Completion Rate speedometer — Shows, as a percentage, the work group's throughput of resolved work based on the number of created and open cases. Open Case Timeliness speedometer — Shows, as a percentage, the number of work group cases that are within goal (based upon assignment SLA-related data). Top Performers list — Displays the five operators who have resolved the most cases and related statistics. Case Volume graph — Displays trend lines for new and resolved cases. Displays the 50 cases most recently resolved by the users in the work group. Click a work item's ID to open the case's review form. 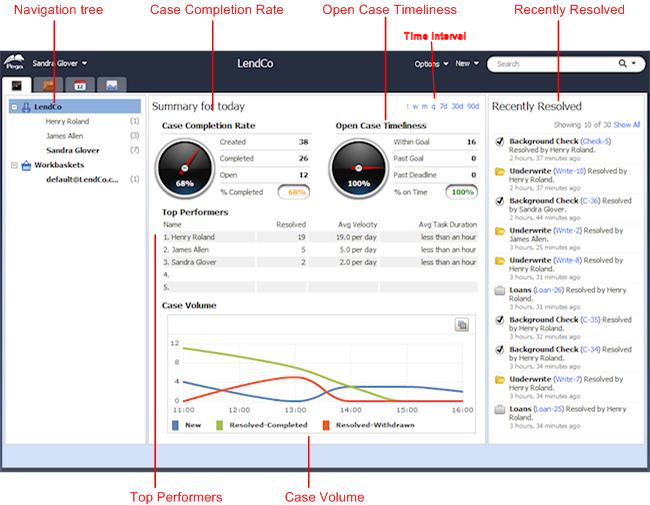 Case Completion speedometer — Shows, as a percentage, the operator's throughput of resolved work based on the number of created and open cases. Open Case Timeliness speedometer — Shows, as a percentage, the amount of the operator's work that is within goal (based on assignment SLA-related data). Performance — Indicates the operator's numerical standing among the other operators in terms of cases resolved. Urgent Work —Displays the top 25 case assignments that have the highest urgency values. You can copy and customize the report definition Assign-pyAssignmentWorkList to suit your requirements. By default, the maximum number of cases displayed is 500, which is set in the Maximum Number of Rows to Retrieve field on the report's Data Access tab. 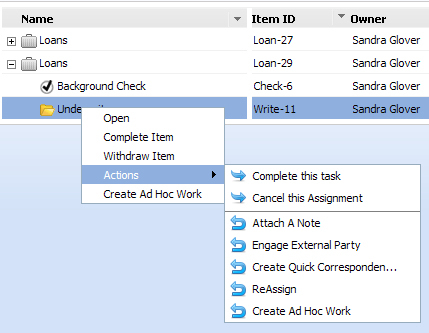 Users can transfer assignments by dragging the item's row header from the user's work list to an operator or workbasket in the navigation tree. Workbaskets — The user clicks the icon to display, in the summary workbaskets dashboard, a list of urgent work items for all workbaskets in the application. Clicking the name of a workbasket in the tree to open its list of urgent work items. The numeric value next to the workbasket name indicates the number of assignments in the workbasket. 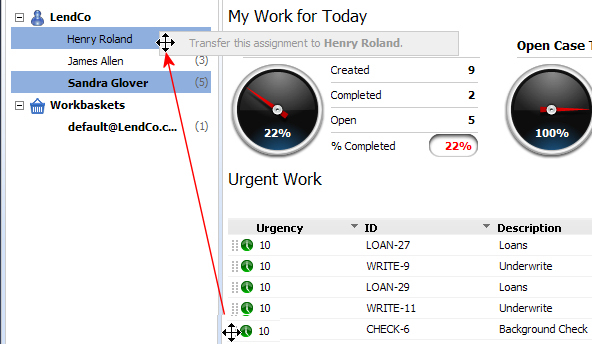 Users can transfer work between workbaskets using the drag-and-drop transfer feature. The case is in one of the operator's work pools, is not resolved, and is not covered by another case. The current operator is a party to that case. The node does not appear if the current operator is a party to only a subcase but not to the top-level case. The user selects a case to expand it and display its subcases. In the example below, the Loans case has two subcases: Background Check and Underwrite. Selecting a subcase displays, in an embedded pane beneath the grid, the user form's work summary section ( pyWorkSummary ). The user can click the breadcrumb link in the header to open the parent case in its user form. The system uses the standard report definition Work-.MyCasesReport to display the he top-level cases. By default, the maximum number of cases is 500; the value is set in the Maximum Number of Rows to Retrieve field on the report's Data Access tab. When the user expands a case to display its children, the system the Work- pyLoadMyCasesNested report, which has a default limit of 500 subcases. The user can perform actions on a case or subcase by right-clicking the item in the tree. Open — Opens the case's user form in a portal tab. Complete Item — Resolves this case (assuming it has no required and unresolved subcase(s)). Withdraw Item — Reject and withdraw this case. Actions — Lists the connector ( ) and local ( ) flow actions for this case. Selecting an item opens its user form. Create Ad Hoc Work — Under the parent case, create a subcase and start a work process that is not defined as a case type in the application structure. When the user selects this option, a modal dialog opens and presents a new work form for entering goals and deadline SLA information. The user can select either of two standard ad hoc processes. When the user creates the ad hoc case, it appears in the tree indicated by an ad hoc work icon ( ). With the required permission, the user can convert directly from the portal the ad hoc work into a case type work class. An Event Subscriptions button ( ) in the left area. A case SLA calendar in the center area. Case SLA Calendar — Displays case goals and deadlines based upon work item SLA values. Goals appear in orange; deadlines in red. View the dates by day, week, or month (default). Click a goal or deadline icon in the calendar to open the item. The calendar is configured as a gadget located in the pyCMEvents section named pxCalendarViewGadget , which you can customize. Event Subscriptions button — Define business events that will trigger system actions such as notifying subscribers, calling an activity, or starting a flow. The events and conditions are defined in a work item. Actions — The system sends an email notification to the loan department manager, and starts a process in the marketing department for setting up the customer as a gold-level account . 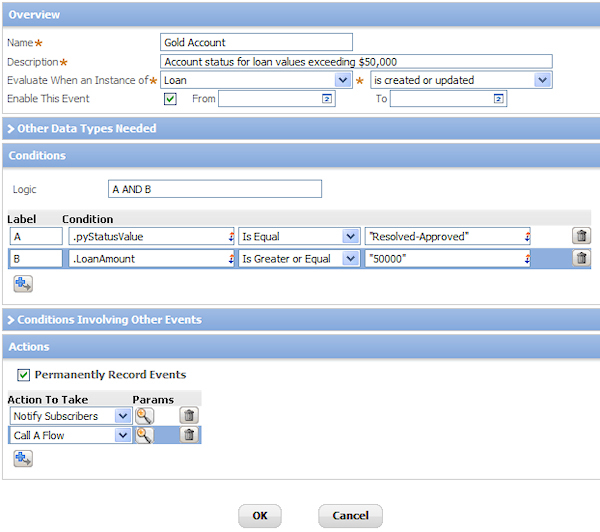 To define the events and related actions for a subscription, the user clicks the Event Subscriptions button to open the Event Definitions tab. The user clicks New to open the New work item form and enters the information. When the user clicks OK, the event definition is created and appears in the Events Definitions tab. Browse and search for available existing reports. Create new reports and modify copies of existing reports. Use a library of SQL functions to build powerful expressions to return exactly the data the report needs. Share report shortcuts with colleagues, and use shortcuts they provide. Re-organize reports within defined categories. Export reports to spreadsheets or as PDF files. Clicking an item in the list opens the report in the Report Viewer. 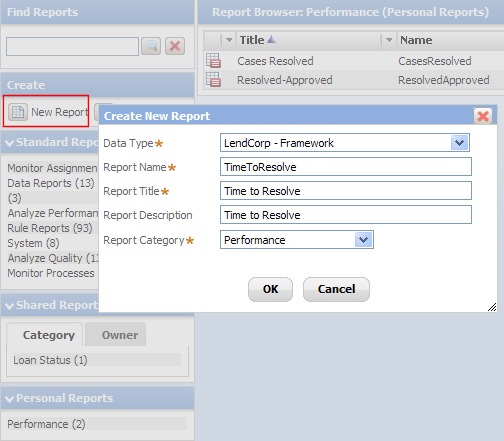 The user can create personal reports clicking the New Report button, which opens the Create New Report dialog. 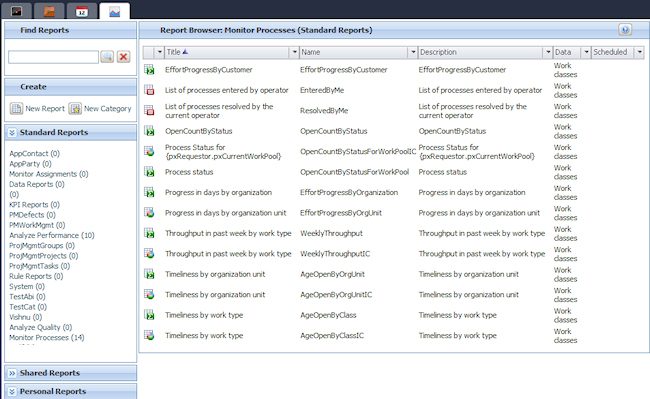 The user opens the new report in the Report Viewer to configure it. The report can then be copied into Shared or Standard Reports categories.